The flu bug was seen in Lake Forest Park on Sunday. The VW parked at Town Center is part of a viral marketing campaign to promote a test to determine influenza. The advertising agency has painted cars and hired actors all over the United States to play Captain AntiVirus, drive around and talk to schools, groups, and individuals about the dangers of flu, and the ease of being tested. Quidel, a manufacturer and developer of influenza tests, wanted a way to get more people to recognize the dangers of flu and drive home the fact that they need to take precautions to avoid being infected or seek treatment if, in fact, people feel ill.
To move the needle, so to speak, the company enlisted the help of an agency that specializes in word-of-mouth campaigns. 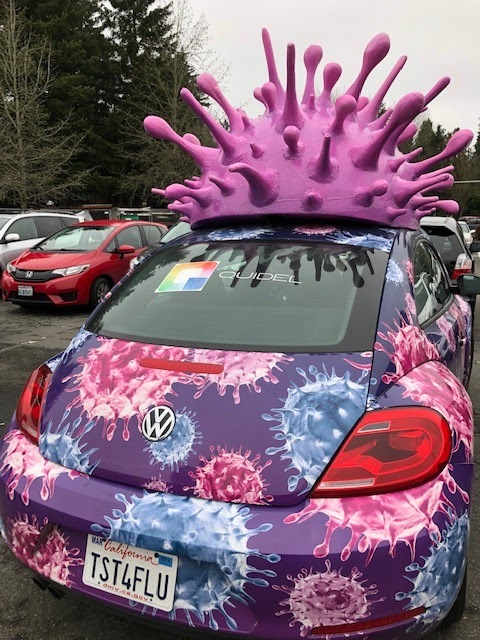 The campaign is already seeing a payoff, helping change the way the influenza virus is viewed in a way that gets noticed, which includes a batch of VW Beetles and a giant flu virus model. "The most commonly used test is called a rapid influenza diagnostics test, which looks for substances (antigens) on a swab sample from the back of the nose or throat. These tests can provide results in about 15 minutes. However, results vary greatly and are not always accurate. Your doctor may diagnose you with influenza based on symptoms, despite having a negative test result."